Can you tell us how you came to work in the computer game industry? I grew up loving to draw spaceships and things like that, imagining worlds and stories in them. 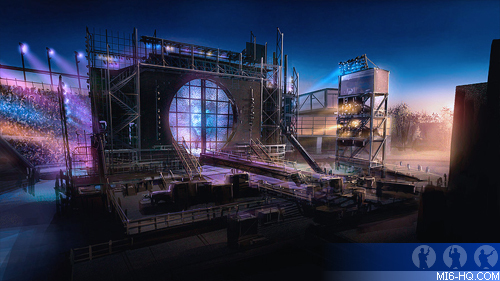 My first job out of college was working as an illustrator/designer for a theme park design firm in Toronto, Canada. That was a lot of fun but I couldn't reach out past the barrier that stops rides from being actual worlds. I left after 5 years to focus on my portfolio, reimagining it to appeal to games or film. I got my first job in Germany for a small game company so I moved out and got my foot in the door. 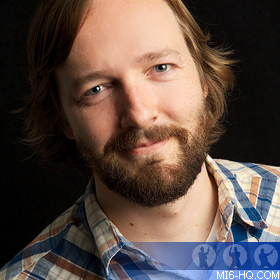 How did you end up working on the Activision James Bond game "Quantum of Solace"? What was your role and when did you start working on the game? I was working for Activision at a studio in Foster City, just outside San Francisco, California. We had some time between games in our studio and we were able to contribute to what Treyarch was working on. I was super excited because it turned out they were developing the next Bond game, this was a dream come true for me as a long time 007 fan. I came on as a concept artist in spring 2008, helping the art director flesh some moments in the game out. 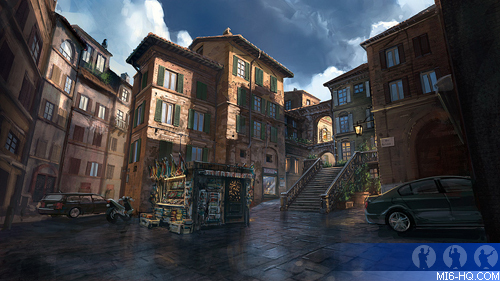 Above: Ryan's concept artwork for the Sienna location in "Quantum of Solace VG". The game was based on both "Casino Royale" and "Quantum of Solace", and at the time "Quantum" was still in production, can you tell us how you were briefed about the environments you needed to create? I was mostly focused on the level from the "Quantum" portion that takes place in Sienna, Italy (with a few other scenes as well). The art director would send me description of the scenes they wanted concept art for to help set the tone and to also figure out the key moments that the player would experience. First I was shown reference from the "Quantum of Solace" shoot and the production design. He would also send me screenshots of the temporary level that the designers had been testing so that I would know how the scene would play out. 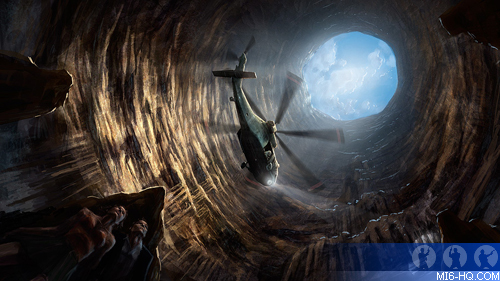 Above: Concept art for the Sinkhole and Tosca sequences. What tools did you use to create the art? The tool I mainly used was Photoshop and a Wacom tablet. I worked digitally from sketch to final. Can you tell us a little about the process you used to create the artwork for the game? I would start with the reference, making sure I had all the information I needed to make sure that the game tied in with the film. Sometimes I would use the rough 3D blockout of the level as an underlay to make sure the art fit the game design, other times I would use them as reference to make sure the concept felt like it would work. Then I would start with sketches, usually black and white to find a good design and layout. Then I would do a colour rough before moving onto polishing the final. 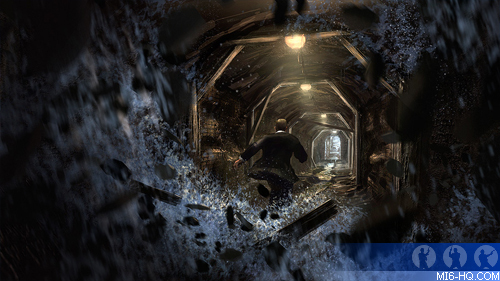 Above: Ryan's favoured concept piece, showing 007 running through the Sienna cisterns. How long did it take to create each piece and how many pieces did you create? Each piece could take somewhere between a day and three days (maybe four, on a more complex shot). I was only on the game for a short period, so I only had the opportunity to create about 12 concepts. Some of these are still my favourites of all the work I've done. Of all the artwork you produced on this game, which was your favourite piece? I am torn between the shot running down the tunnel behind Bond and the one in the square with the vendor stand. I like the tunnel one, since it is an action shot and fun. In the movie 007 is running towards the camera, while in the game the camera is behind him. I like the lighting and the quality of the painting finish of the one in Sienna with the vendor stand. Are you aware of any levels/ideas you mocked up, which where dropped? No, but I'm sure they didn't quite play out as originally envisioned - games can change a lot during production for numerous reasons. I do remember playing the game and seeing my concept art in frames on the wall in the italian interiors - that was a fun surprise, especially because you can shoot them and leave little bullet holes on the glass. Many thanks to Ryan Dening.